Lardos is a small, friendly, traditional Greek village that is home to just over a thousand people and recieves some of the best weather on the island. Unlike the more famous village of Lindos, 6 miles down the road, Lardos has far more locals than visitors, and so still feels very Greek, with square white houses clustered round the watering hole – or in this case a fountain, in the shady village square. 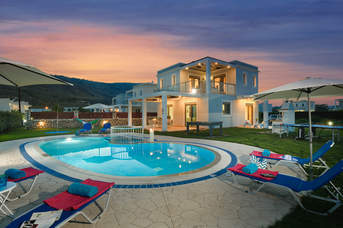 Most of our villa are located just oustide Lardos Village itself, in close proximity to Lardos Beach. This laid back seaside resort is made up of a collection of hotels, apartments and villas. The Blue Flag Lardos Beach is considered to be one of the best on the island, with shingled sands that shelve gently into the turquoise waters. There is a good spot for water sports, including paragliding, jet-skis and pedalos, diving and snorkelling. Nearby Glystra Beach is much quieter with a great family atmosphere. This is a place to just lie back and watch the canoes and pedalos go by. There are seashells to collect as you paddle on the shore, and an exceptionally good beach canteen.Receiving some of the best weather on this already sunshine soaked island, the small, friendly village of Lardos is a great holiday destination. Lardos attracts locals and tourists alike thanks to its stunning scenery so a holiday here is sure to give you a real taste of Greece. 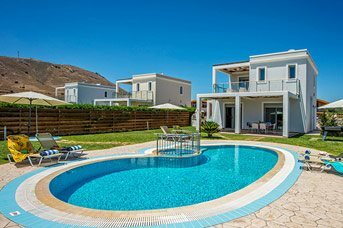 This scenic resort is perfect for a relaxing holiday and Lindos is a short drive down the road with a large selection of shops and tavernas as well the famous acropolis. Lardos has a mini market along with a variety of small shops including a newsagent, boutique shops as well as a bakery selling fresh produce daily. If you’re an early bird, why not buy fresh fish from the fish mongers? Lindos is just a stone’s throw away and has a choice of small boutique and craft shops. Rhodes Town has a huge selection of shops and designer outlets. Stroll through this quaint village and relax in one of the traditional bars, tavernas or cafes. The numerous local restaurants serve a variety of mouth-watering traditional Greek and international dishes. Try a glass of ouzo, a Greek liquor favoured by the locals, many of whom sit outside the bars playing backgammon. Local bands will occasionally play live music in the village square or head into one of the hotels offering evening entertainment. Alternatively, Pefkos and Lindos are close by with an even greater selection of bars and restaurants sure to suit all tastes. 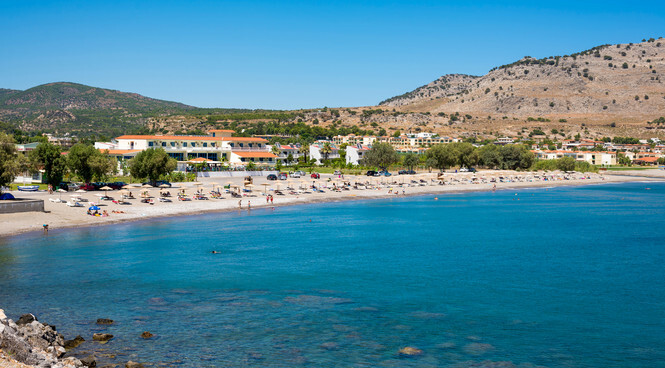 It’s no secret that Lardos Blue Flag Beach is one of the stand-out reasons why visitors keep returning to this village. A mixture of shingle and sand that shelves gently into the turquoise waters, this bay is popular for water sports, diving and snorkelling and extends all the way to Lotharika. Nearby Glystra beach is a much calmer bay with shallow waters perfect for families. The picturesque Lindos and Pefkos Beaches are just a short drive from Lardos and great alternatives. One of the biggest waterparks in Europe is less than an hour’s drive away in Faliraki! Lardos itself has plenty of water sports on offer. Hop on a glass bottom boat trip from Pefkos and pootle around the pristine bays that the East coast has to offer. Hellas mini golf is a great family activity with 18 holes recognised by the World Mini Golf Federation. Visit the folklore museum for a unique insight into the history of local life on Rhodes. Lardos is also home to a go-karting track – perfect for those looking for more excitement. Lindos is just a short drive up the coastal road with white washed buildings overlooked by the famous acropolis. A little further along the coast is the picturesque St Paul’s Bay, a real aesthetic treat with crystal clear water and a chapel perched on the headland. Get lost in the medieval city of Rhodes Town with ruins and relics from the Ottoman and Italian occupations. The old town is sealed like a hidden time capsule within the sprawling new town and a real step into history.